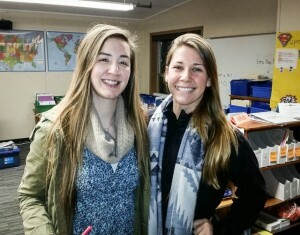 Years ago, two Seattle area grade school sisters benefited from the the World Vision outreach after school tutoring program called Kid Reach. The Northeast Seattle sited program involved one-on-one homework help with a games and snack component to support learning and positive mentoring. Fast forward to 2015-16, Kaela V, the oldest of the two is now married and working. Ava V, the younger, has just finished college and now finds the time to volunteer herself. Both give their time now at the Lake City After School Program. Sited at Olympic Hills Elementary School, the ELL focused offering operates two days a week. In concert with on site ELL instructors, one-on-one engagement supports and re-inforces daily instruction. Now in its third year, the campaign to support English Language Learning has evolved. What has been consistent and not changed is the strong volunteer group engaging the students. Good work Kaela and Ava.